The R.J. Toomey Mantelletta is essentially a sleeveless purple cape that falls to about the knee. 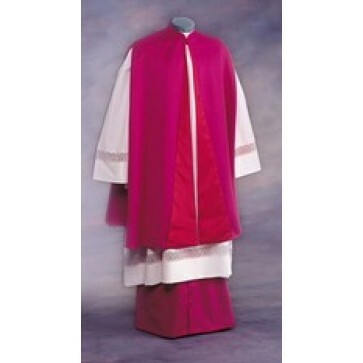 It is altered to have a cassock-like collar and deep arm slits. The vestment is most commonly worn with a white choir cassock and a lace-trimmed square neck surplice. No the Mantelletta is made of 100 percent woven polyester that is easy to care for and comfortable to wear. The R.J. Toomey purple Mantelletta is made by one of the most beloved Christian brands and is available from Matthew F. Sheehan.